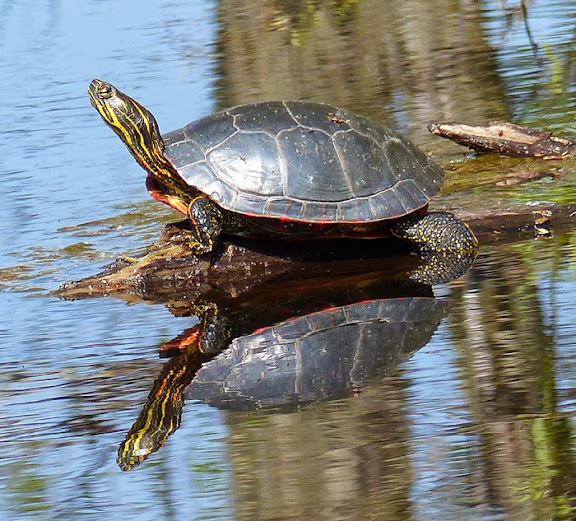 This beautiful turtle is a common sight in Minnesota. Western painted turtle, Chrysemys picta bellii, basking in a pond. originally posted on Version 1 of the Dinosaur Toy Forum. These things love to Cross the highway here in Iowa. Me, and my dad used to catch them, and take them home as "Let Go Pets". We seen the in many sizes, and the biggest one I caught was on the railroad Tracks by the River. Today, I never see them, because my dad died, and I cant get out in the wetlands as much anymore. Glad to see that others share my appreciation for this turtle, stargatedalek and Takama and Rex. In early June many females cross highways to find nesting sites. We can prevent a road kill by carrying her across to the other side. Really beautiful replica with a beautiful color pattern . I repainted the Safari red-eared before I finally found a Larami western painted figure. Nice job on the repaint! It looks much better than the Larami. Painteds are not so common down here in Tennessee. I think the sliders exclude them from a lot of habitats they occupy further north. I'm always excited when I see one- usually in a willow- and buttonbush-choked backwater. Yeah, we have midlands down here around me, and southerns not far away. They're all pretty turtles. Here in TN it's illegal to keep any turtle, so you're one up there. I was lucky enough to work in the herpetology lab when I was in college; we had a number of (mostly native) turtles used for demonstrations, and occasional study animals passed through too. So, I've gotten to care for quite a few of our local species, including both subspecies (or species, depending who you ask) of painted turtle found nearby. I miss that job. Thanks for the kind comments about the repaint, Jetoar and Newt. That's an awesome repaint of the IC Red-eared Slider, stemturtle!